I learned a few things yesterday. Valby kulturhus is a pretty good venue for hosting small concerts. It probably has room for about 200+ and the sound is quite good in there. Also they had cheap drinks which is also a huge plus in my book. Unfortunately the gig was almost secret as it has had virtually no promotion, and I only learned about it by coinsidence a few days before it was held, so the result was a poor crowd of maximum 50 people most of them friends or other band members. Anyway, Voodoom opened the evening with their voodoo reggae. I'm certainly not a huge fan of reggae and I wasn't that impressed. The bandmembers were really into it with painted faces and their fans were dedicated too. But even though the female singer sang really well, it never really had any real impact on me. Mostly because I hate reggae. They played a very long gig. More than 2 hours I think. Main act (for me at least) was Hola Ghost. 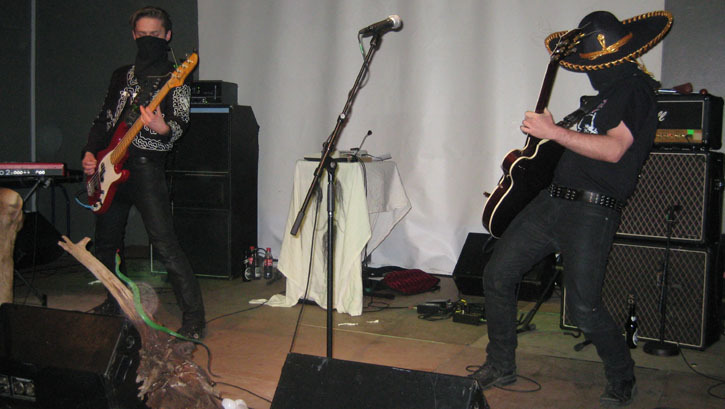 The psychotic flamencore duo with Peter Sandorff (ex-Nekromantix) on guitar and Jeppe on bass, that is now more of a trio since Mia joins in on electronic organ on several songs. Hmmm, it's even more complicated since there is one more very central bandmember: the legendary Ghost 707 (a Roland TR-707 drum machine.) Some of their songs are taken from the Gris Grimly film Cannibal Flesh Riot! for which the band has written the soundtrack. But live they play a lot of other songs like Night of the Vampire that haven't found their way to an album yet (but it can be found on a Joe Meek tribute album.) Most of it doesn't sound too far from the title track of the movie and it clearly shows that Peter was a long time member of Nekromantix. I like it and I'll be back for more next time, if the gig isn't so secret that no one finds out. I bought the soundtrack cd and also the movie on dvd, and although it is low budget it is actually quite funny. The dvd also contains a cool cd that holds music by many rockabilly inspired bands including: Hola Ghost, The Untamed, The Death Riders and many more.